Please note, deleting your MyHein account will not affect your HeinOnline subscription status or your ability to access HeinOnline. MyHein is HeinOnline’s personal research tool. For more information about MyHein, please see our MyHein User’s Guide. First, make sure you’re logged in to HeinOnline. Next, log in to your MyHein account by clicking “MyHein” in the menu bar at the top of the page, then click “login”. Once you’re logged in to MyHein, “Delete your MyHein account” will appear as an option in the MyHein drop down menu. Next, click “Delete your MyHein account”. You will then be prompted to confirm deletion. 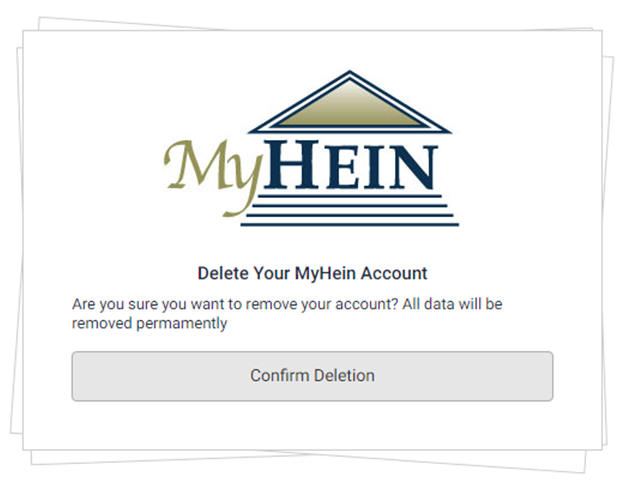 Finally, click “confirm deletion” to permanently delete your MyHein account. A confirmation will be sent to the email address associated with the deleted MyHein account. Deleting your MyHein account is permanent and irreversible. Data cannot be retrieved once a MyHein account has been deleted.